So we got the start of the book of Secret Of The Unicorn, opening with Herge himself drawing Tintin at a market stall (and displaying his many other characters), before the story segued into Crab With The Golden Claws, for the first sighting of Captain Haddock. Bits of Red Rackham’s Treasure were in there as well. In fact I think the only bit of the film I wasn’t super-keen on was the entirely new material — the extended action scenes in the town, and also later at the docks, both of which just stretched credulity a little too far. Of course, Tintin stories have always been just slightly implausible, but the whole bit with the motorbike, tank, breaking dam and all the water flowing through just took it too far, I think. Still, all in all a most enjoyable movie. There’s clearly an opening for a sequel, and I for one hope that it does well enough that they make one. And here’s the… well, dumbed-down, deep-voiceover version for the North American market. Sigh. A power that could have changed the course of history was lost. — What the heck is this on about? Generations have searched for it. — Have they? I’m pretty sure the film doesn’t actually say that. We also went to see it last night (at the Coburg Drive-In, where we try to see all our block busters) and was very very disappointed … The film seemed to be a mash-up of The Secret of the Unicorn, a gutted Red Rackham’s Treasure (no Calculus, so no shark submarine) with a side order of The Crab with the Golden Claws (to introduce Haddock). I can understand the need to whittle down the number of characters required to tell the story and somehow introduce the audience to some of the back story, but … it was just so so badly done – especially the action scenes as you point out. Still, this was from the guys who made the Indiana Jones movies so we should expect some action schlock but it was a shame to see Tintin reduced to that level. I thought I’d have a problem with the character modelling, but that was actually fine once I got used to it. Having grown up with the cartoons and comic books, I was prepared to be disappointed but found myself thoroughly enjoying this film. Here’s hoping for a sequel with Calculus and an expanded role for Castafiore. Perhaps based on The Seven Crystal Balls/Prisoners of the Sun? 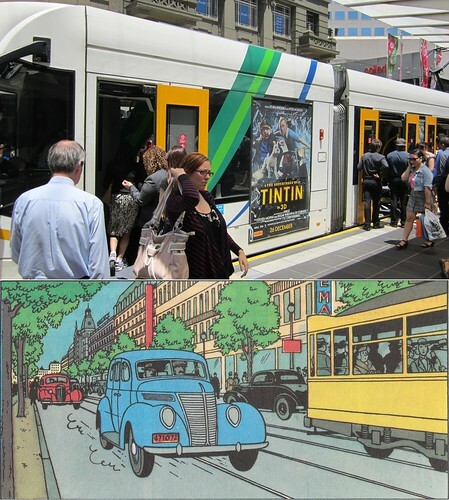 when I was a kid, we didn’t have tintin. Only rintintin.